G’day, mates! 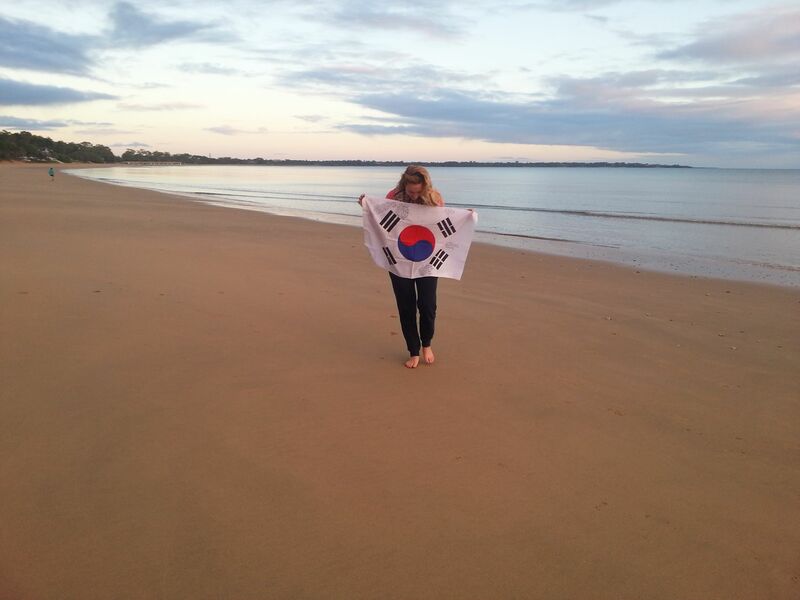 Right on impeccable schedule, the flag has arrived at its fourth continent, all the way to Carly in Oz! Carly is the first recipient of the flag to surprise-update me on its status (as opposed to me harass-hounding for it). After wondering if the flag was at long last lost in the land down under, I received a teaser -a picture of the flag still wrapped in its prepaid postage, and a line asking if she could take it on an impromptu road trip with friends to the ocean (which, by all means, of course! ), and then I got these! I just want to take a moment to thank the all-star postal workers who make these thrills possible. Unlike our other comrades’ in this vexillological epic, Carly’s story is one that I’ve gotten to know better after Korea. Thanks in part to social media, but more to our interest and rad communication skills, I know and appreciate more about Carly than I did after our bizarre Christmas scavenger-photo hunt in 2012 and blizzardy pre-dawn hike up Uam Mountain in 2013. As a direct result of her ability to articulate important ideas, Carly’s thoughtful and intelligent Facebook posts on health, social, and political awareness, has influenced me beyond “likes” and “shares”. Before becoming one of her biggest fans, I had no idea of the challenges of Indigenous people living in Australia and the parallels between the civil rights movement there and America’s own, still progressing today. You may be familiar with the struggle from emerging mainstream coverage such as the article publishing the sentiments of the famed model, Samantha Harris, Australian Idol, Jessica Mauboy, and AFL star, Adam Goodes (all of Aboriginal descent) on the controversy of Australia Day. What she advocates and strives for is admirable and makes those who take notice, want to act too. I could go on about our cross-overs with social service, mental health, education, veganism, environmentalism, equality, and yoga, but my point is, girl is real. And talented. And she uses her powers for good. Besides a knack for delighting Koreans with our strange photography traditions, little did I know how much we had in common under the surface, during the short time our contracts overlapped in Korea. Back then, we lived in completely opposite ends of the city under different schedules. Today, from nearly nine-thousand miles away, we inspire, encourage and support each other in bettering ourselves and in trying to make the world a better place as well. It starts with a suggestion, a Facebook invite or tip on Instagram, and leads to causes we can affect, events we can attend and common friends we can make. Social media networking at its finest! A lot of people talk about things they want to do. Carly does them. It can take an unbreakable amount of heart and inexhaustible energy to be such a doer. When feeling human, sometimes a sense of solidarity even an ocean and a hemisphere away is all a soul sister needs to bolster hope and strengthen motivation. In the book, The Heart and the Fist: The Education of a Humanitarian, The Making of a Navy Seal, author Eric Greitens sums up, “The great dividing line between words and results is courageous action” of which Carly has the capacity to take -a quality not often encountered without first being open to discovery, and life outside our comfort zones. Watch this ever-increasingly beloved worldly trinket come on back home to America as it reaches the Pacific Northwest!